We have a fine ring of bells under the direction of our Captain of the Tower. Bell ringing is a healthy, musically satisfying and enjoyable hobby. If you are interested in joining the team please ask our Parish Administrator for details. 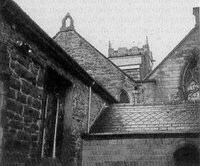 The first reference to a Church in Chorley is in 1362. We do not know what this building looked like (though parts of it survive in the present Church), but it is almost certain to have at least one bell to summon the people to worship. There was also a small scaring bell, which was rung at particular solemn moments of the Eucharist. This bell hung from a small arch over the chancel which still survives to this day. The present Tower seems to be rather younger than the original Church building, and is usually dated at around 1400. Its size is such that it was probably created to house more than one bell. Certainly, by 1552, the Church had ‘three Greater belles’. These were listed in the inventory of Church Goods made that year by King Edward VI’s Commissioners when they visited Chorley. One or more of these three bells may have been installed when the Tower was first built, only 150 years before. By the middle of the next century, what was probably the surviving bell was itself in need of attention. It was decided to break it up, add more metal and recast it. The following entry from the Parish Register tells what happens. I beare my part in consort’s pleasing sound, but when alone I summon to the ground. The day is over cease from labour, I call to rest. Our voice do with cheerful sound make hills and valley echo round. Each time the bells have been recast since, these inscriptions have been placed on the new bells. As the accompanying photograph of the ringers in 1875 shows, the bells at this time were rung from ground level in the West porch. 1.John Hy Gartside, Conductor; 2. William Heaps; 3. John Marsden; 4. Alfred Whalley; 5. George Gartside; 6. Joshua Worthington. 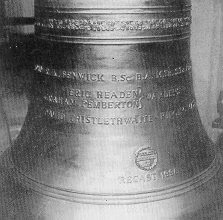 The smaller bells in particular were described as “hard, harsh and stifled.” Nor did the tuning of the bells match up exactly with the founder’s specifications. The frame and fittings were, however, found to be in generally good order and, with some repair and cleaning, were reused in the 1996 refit. Happily, on this occasion, thanks to the generosity of Kathleen Norris, the resources were available to undertake the recasting of all eight bells. The Parish Church Council approved the project as desirable in itself and as a fitting memorial to Mrs. Norris The Diocesan Advisory Committee also gave its approval and the Rector and Wardens petitioned for a faculty which was granted by the Worshipful John Bullimore, Chancellor of the Diocese of Blackburn on 13th February 1996. 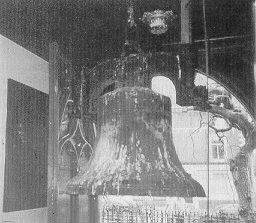 Taylor’s Bellhangers came to Chorley at the beginning of May to dismantle the bells and their fittings and to lower them down the tower. The old bells were loaded on to a lorry on 3rd May and transported to :Loughborough. Once at the foundry they were broken up and the metal melted down. The molten metal was assayed, and extra metal added to being the proportions up to the correct levels. The metal was then cast into ingots to wait the recasting. Over the preceding weeks the moulds had been prepared and buried in the foundry sand pit. The actual casting took place on Friday 17th May 1996. A coach load of parishioners travelled down to Loughborough to watch the dramatic process. Once cooled, the bells were transferred to the tuning shop and tuned as an octave on a 19th century vertical lathe. Towards the end of this process a second coach load of parishioners visited the foundry on Saturday 22nd June, and thus were the first to hear the sound of the recast bells. The bells were returned to Chorley on Friday 30th August and placed in the body of the Church for their consecration by the Bishop of Blackburn in the context of the Parish Eucharist on Sunday 8th September. As well as the various inscriptions, the bells were all decorated on the shoulder with the vine-leaf motif shown below.